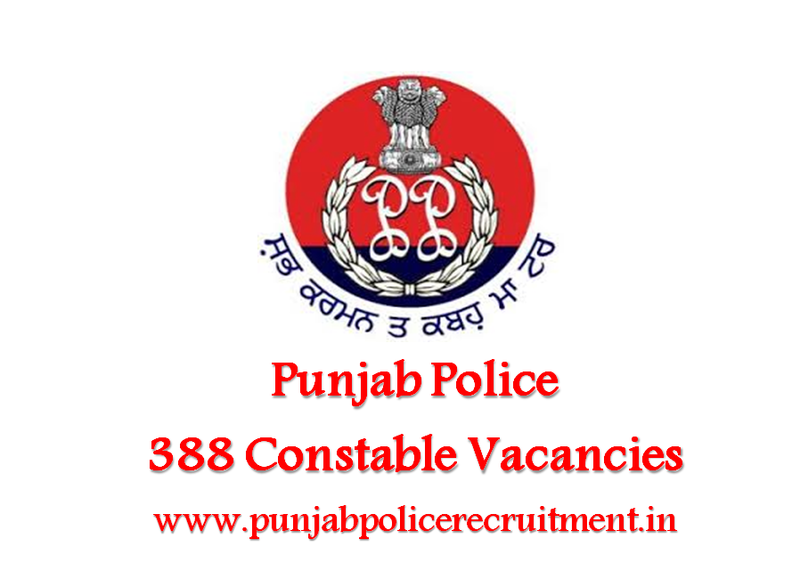 Punjab Police invited applications for recruitment to 388 Constable posts. The candidates eligible for the post can apply through prescribed format on or before 05 September 2016. Eligibility for Constable (Operator) post: 10+2 (with Physics as one of regular subjects) from the State Board of Education / any recognized Board or University with at least six months basic computer course (at least 200 hours) from an institute recognized by the Government; OR 10+2 (with Physics as one of the regular subjects) from the State Board of Education / any recognized Board or University and B.Sc. (I.T.) or Bachelor in Computer Applications from a recognized University; OR Matriculation from the State Board of Education / Any recognized Board and Diploma in Computer Engineering / Diploma in Electronics & Communication Engineering (Duration 3 years) from a recognized State Polytechnic Institute / College approved by All India Council of Technical Education (AICTE); OR Graduation in the field of Electronics / Electronics and Communication from a recognized University. Candidates are required to send their applications online along with application fee of Rs 400 (Rs 100 for SC/ST/BC candidates and no fees for Ex-Serviceman candidates). The Application fee can be deposited online, while filling the Application Form, by (1) Net Banking, (2) Debit/Credit Card Payment or offline, along with the printout of the Fee Challan Form, which will be generated after the First Page (Registration page) of the online Application Form has been submitted successfully, at: - (a) HDFC Bank (b) Punjab Police Saanjh Kendras.